Robbi Nester is the author of a chapbook of poems, Balance, that follows a sequence of Iyengar yoga poses (White Violet, 2012). 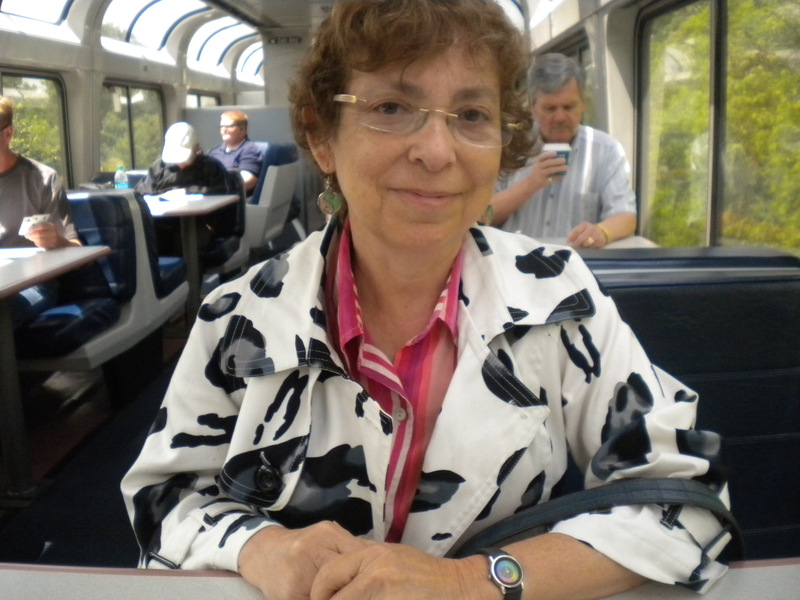 She has published poems in many journals, including Poemeleon, Inlandia, Broadsided, Lummox, Qarrtsiluni, Northern Liberties Review, Philadelphia Stories, Floyd County Moonshine, and Caesira. They have also been anthologized in Point Mass, Poised in Flight, and The Poetry of Yoga, II. Her essays, reviews, and interviews have appeared in The Hollins Critic, Switchback, and The New York Journal as well as the anthologies Flashlight Memories and Easy to Love but Hard to Raise. Robbi is currently assembling an anthology entitled The Liberal Media Made Me Do It!, composed of poems and artwork inspired by NPR/PBS stories and shows, to be published by Nine Toes Press. Describe the inspiration or process of creating the particular piece you wrote for this issue from the prompt you used. This was a particularly challenging group of words. It seemed like something one might find in a description of a parka at a camping and outdoors store. I had to think a while about how I could use these words in another context. But there were two words that gave me my cue: first, “muskrat.” I’ve never seen a live muskrat, though I did once buy a vintage muskrat stole back in the day, with shoulder pads! Mostly I’ve seen them only after they had a run-in with a car or two, dead in the road. Then “videographer” told me this was going to be a poem about seeing and recording what I saw. “Featherlight” suggested where the poem might be going.All I had to do after that was conjure up the scene the words seemed to suggest. How much of this piece was the result of initial inspiration, and how much was the result of it twisting and turning along the way? It all came from that initial realization that it ought to be about a dead animal, though I struggled with the actual writing, as one generally does. The thing was not to fall off the edge and make this poem totally disgusting. When I was a very young writer, as an undergraduate, I reveled in writing the gross, trying to be edgy, and tried to bring beauty to things that were horrific. That was a pose of course, but being oppositional by nature, I took it to avoid the too precious realm that beginning writers often fall into, the sentimental and gooey. I knew to avoid that, and it wasn’t my nature either. Are there any themes that tend to pop up frequently in your writing? What draws you to write about these? What appeals to you about the particular genre(s) (i.e., poetry, fiction, non-fiction, etc) you tend to write in? I guess that in the process of answering the previous questions, I have begun to answer this one as well. I often write about the natural world. I think in fact that all the poems I’ve published in your journal have been on this theme. I just finished a collection of ekphrastic poems, collaborations with artists and photographers, mostly contemporary ones. I hope the book will appear next year. I am thinking that the next collection of poems I write will focus on the natural world and scientific theories and ideas of various kinds. It is a topic I have treated before, but not to the exclusion of everything else. This time, that’s what I’m planning. But we’ll see how it goes. The question of why I write about this subject is a hard one to answer. I have not really studied science formally. I just like to read and think about it in a more informal way. Why I write poetry is another sort of question. I can answer it obliquely. Before I fall asleep every night, I hear music. Usually it is music of my own composition, I think, though I have no training in music, and indeed cannot read or write notes. Writing poetry is definitely connected with this music. The words and concepts make music of a sort. They have that added dimension of sound that makes something a poem rather than just a bunch of lines. I love telling a story, but I do not naturally gravitate toward the creation of characters or a plot, though I enjoy reading novels and short stories. I do not write them. At the moment I am between projects, toying with ideas, but not yet taking on any one of them. This may be because the anthology I edited, The Liberal Media Made Me Do It! (Nine Toes Press), poems inspired by NPR and PBS stories and shows, just came out, and I am trying hard to market it, which isn’t easy in a world largely indifferent to poetry. And my first full collection of poems, A Likely Story, comes out in a month or two. I also have, Together, the manuscript of ekphrastic poems and collaborations with visual artists, mostly, though there is also a collaboration with another poet in it. It will be very expensive to produce because it is packed with full-color plates, worked in with the poems. A publisher has shown interest in doing it, but I have to wait for a while. I am occupied also in trying to figure out how to earn some money by writing, something I have not yet been able to accomplish in any sustained way. I just came back from a trip to Israel (my first), where I visited with family. It was amazing, and it gave me an idea for an article I’d love to pursue, but I’d need funding to go back and to pay someone to translate for me. I never learned the language. What was the first (or an early) work of literature you remember falling in love with? What appealed to you about it? I lived across the street from a library, and had read everything in it by the time I was about 13 or 14, at least everything that held any interest for me at all, in both the children’s and adult’s sections. I love and loved fantasy, and read The Phantom Tollbooth, by Norton Juster, over and over. I think I started doing that in about third grade. And the Alice books, and Ogden Nash, and the Archie and Mehitibel (sp) poems…I always had a stack of books and would read them all at once… a bit of this one, then that. And I’d be watching TV at the same time. But re: what appealed to me about Juster’s book was first that it was the kind of thing I wished would happen to me, a foray into an alternative universe, a world of language, where ideas came to life. The appeal of Alice was similar, though of course it is a masterpiece, and the poems in there still inspire me, as does Jabberwocky.